US west coast populations of the native Olympia oyster Ostrea lurida declined precipitously in the late nineteenth and early twentieth centuries and were often replaced by the non-native Pacific oyster (Crassostrea gigas) by the aquaculture industry. Recovery of native oyster ecosystem services derived from their suspension feeding activities (termed “filtration services” (FS)) often serves as a powerful incentive for restoration of populations of O. lurida along the US west coast despite uncertainty about the potential effects of their filtration activities on concentrations of suspended particulate matter. Here, we provide an improved FS model for O. lurida and C. gigas in Yaquina Bay, OR, that is based on both in situ feeding behavior and the complex hydrodynamics of the estuary. The total area and the order of locations chosen for oyster restoration in Yaquina Bay were examined to determine how oyster FS could be maximized with limited resources. These modeling efforts quantified estimates showing (1) native oysters, if restored in Yaquina Bay to historic levels, may contribute nearly an order of magnitude greater FS than previously estimated; (2) C. gigas contributes significantly greater FS than O. lurida, especially during the wet season; (3) FS provided by either species is highly dependent upon seasonal river forcing and salinity; (4) spatial variation in FS arises from the hydrodynamics of the system, uneven oysters distributions, and upstream pre-filtering. We found that spatially explicit models demonstrated the benefits of prioritizing restoration to areas with the greatest FS potential, rather than placing oysters randomly within historic habitats. Directing restoration in this manner used between 75% (dry season) and 60% (wet season) less of the restored area needed to achieve comparable FS with randomly placed oysters. The online version of this article ( https://doi.org/10.1007/s12237-019-00515-3) contains supplementary material, which is available to authorized users. Oysters are considered keystone species due to the numerous ecosystem services (ESS) they provide in coastal environments. These ESS include food resources for humans and other predators; creation of substrate structural heterogeneity that provides refugia and essential nursery habitat (Gutiérrez et al. 2003; Lenihan and Micheli 2001); wave attenuation and shoreline stabilization (Meyer et al. 1997; Scyphers et al. 2011); suspended particulate matter removal by means of their filtration activity (referred to here as filtration services, FS), which leads to benthic-pelagic coupling (Norkko et al. 2001; Porter et al. 2004) and influences on biogeochemical cycling (Coen and Luckenbach 2000; Kellogg et al. 2013, 2014). Unfortunately, ESS provided by oysters throughout the world have been greatly diminished following the decline of many native populations (Beck et al. 2011; zu Ermgassen et al. 2012). Restoration efforts throughout the USA are currently underway with the explicit goal of enhancing the ESS provided by oysters, including those of Olympia oyster (Ostrea lurida), which is the only native oyster on the US west coast. This species was once abundant in estuaries and bays of the Pacific Northwest (PNW) but populations were heavily impacted by overharvesting, habitat degradation, and pollution (White et al. 2009). In recent years, this species has garnered greater attention from ecologists, conservationists, and stakeholders who hope to restore populations and associated ESS. Unfortunately, there is limited information on the feeding physiology and ecology of O. lurida. Consequently, the potential benefits of enhanced ESS and FS associated with restored populations. In general, the ability of restored native oysters to effectively exert top-down control over phytoplankton blooms and improve water quality in coastal ecosystems remains somewhat equivocal and has sparked considerable debate within the literature (e.g., Newell 2004; Newell et al. 2004, 2007; Pomeroy et al. 2006, 2007; Coen et al. 2007; Mann and Powell 2007), largely due to uncertainty about spatial and temporal mismatch between oyster filtration and phytoplankton abundance and the access of oyster to the overlaying water. These types of uncertainties can only be addressed through sophisticated models that account for oyster ecophysiology and system hydrodynamics. It is clearly important to be able to predict the ecological outcomes of restoration activities as well as to strategically plan restoration activities to maximize desired effects (Hobbs and Harris 2001). Additionally, it is important to consider how the native FS have shifted with the arrival of the non-native Pacific oyster (Crassostrea gigas) to the west coast in the early part of the twentieth century. The Pacific oyster is now widely farmed on the west coast and has become the dominant oyster species (Pauley et al. 1988) and may offer considerably different ESS than O. lurida (Ruesink et al. 2006; Banas et al. 2007). Recent studies have emerged and enabled us to improve upon previous modeling attempts and create more realistic and accurate models of O. lurida FS in a PNW estuary. Gray and Langdon (2018, 2019) determined in situ feeding behavior of O. lurida and C. gigas in Yaquina Bay, OR, in both dry and wet seasons, creating an opportunity to re-evaluate and compare the seasonal in situ filtration services of these species. Additionally, detailed hydrodynamic studies by Lemagie and Lerczak (2015) provided highly resolved estimates of seawater residence times in Yaquina Bay that greatly improved the understanding of interactions between oyster populations and the overlying water. In this study, we provide spatially explicit FS estimates of historic populations of O. lurida in Yaquina Bay during dry and wet seasons to illustrate the value of combining measurements of bivalve feeding physiology with estuarine hydrographic models. Seasonal variation in FS was estimated based on changes in biotic and abiotic conditions during dry and wet seasons. To estimate how these services may shift in Pacific Northwest (PNW) estuaries with the arrival of C. gigas, we also modeled and compared FS of this species under several different scenarios. In addition, different restoration strategies for O. lurida were modeled to explore the extent to which FS could be affected by randomly placing animals in all available habitats versus prioritizing sites within historic habitats that gave oysters prolonged access to suspended particles. By virtually placing oysters throughout the estuary, we sought to determine the maximum proportion of the bay that could be cleared by oysters. By virtually placing oysters in selected areas of the estuary, we attempted to maximize restoration effectiveness to achieve the highest FS with limited additions of restored oysters. Yaquina Bay is a macro-tidal drowned river-mouth located on the central Oregon coast (44° 37′ 03.98″ N, 124° 01′ 15.46″ W; Fig. 1a; Larned 2003). The historic range of Olympia oyster beds and current location of Pacific oyster aquaculture in the estuary have primarily been constrained between polyhaline (salinity > 18–30 ppt) and mesohaline (salinity > 5–18 ppt) zones. Although the Yaquina Bay has a relatively small watershed (65,526 ha), seasonal rains increase river discharge (Fig. 1b) to greatly reduce the salinity of this historic oyster habitat (salinity < 1 ppt). During rain events, mean flow of the Yaquina River may increase by two or three orders of magnitude (Sigleo and Frick 2007) and substantially reduce the residence time of the bay (Lemagie and Lerczak 2015). We defined the wet season (November–April) and the dry season (May–October) according to Brown and Ozretich (2009) who defined these seasons based on when the monthly average discharge of the Yaquina River was above (wet) or below (dry) the 30-year average discharge of 7.2 m3 s−1. 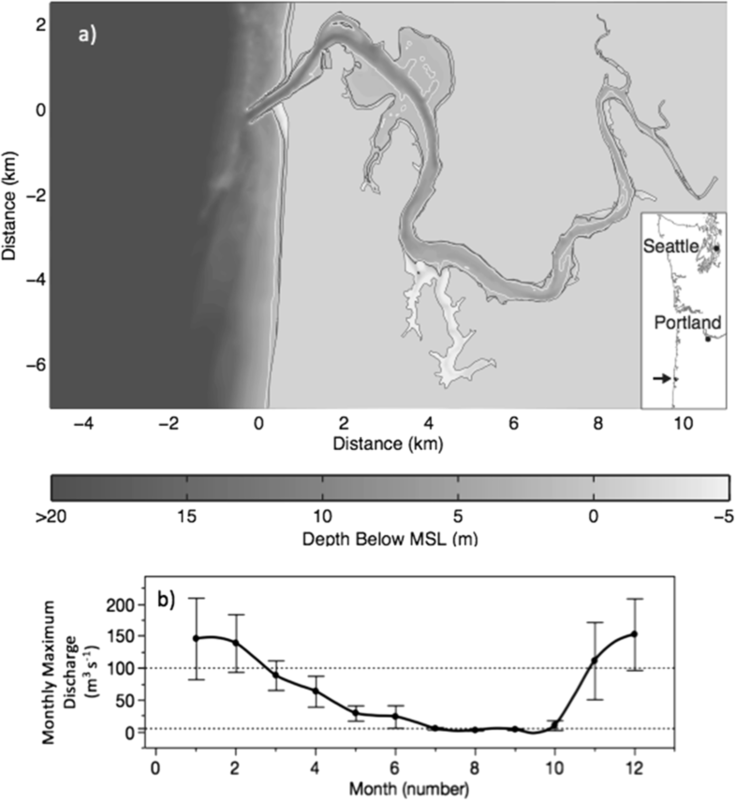 To estimate FS, it is necessary to model the spatial and temporal distribution of clearance rate (volume of seawater filtered per unit time) capacities of O. lurida and C. gigas in Yaquina Bay, OR. Gray and Langdon (2018) determined clearance rates of O. lurida under both laboratory and in situ experimental conditions using the biodeposition method (Hawkins et al. 1996) during the dry and the wet seasons in Yaquina Bay. During each trial, salinity (S), temperature (T), algal concentration (fluorescence), and turbidity were continuously monitored with an autonomous sonde (YSI 6600, YSI Inc. Yellow Springs, OH) while periodic seston samples were taken to gravimetrically measure total particulate matter (TPM) and seston organic content (OC). where CR is the weight-specific clearance rate (l h−1 gDTW−1), OC is the organic content of seston (fraction), and T is the temperature. Lower and upper 95% CI are given in brackets. where TPM is total suspended particulate matter (g l−1) and other variables are similar to those found in Eq. 1. Lower and upper 95% CI are given in brackets. Gray and Langdon (2018) were unable to identify a significant model to specifically describe clearance rates of C. gigas during the wet season; therefore, we applied a statistically significant all-season model (p = 0.0002, adj. R2 = 0.20) to estimate clearance of this species during the wet season. were S is salinity and other variables are similar to those found in equations above. Lower and upper 95% CI are given in brackets. Although salinity played varying roles in the feeding activity for O. lurida (not a predictor in Eq. 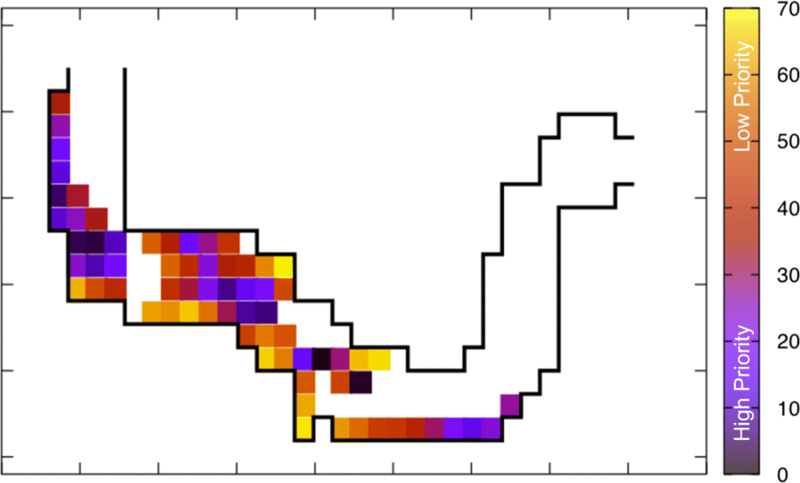 1) and C. gigas (not a significant predictor in Eq. 2 but included in Eq. 3), Gray and Langdon (2018) observed both species ceased feeding and closed their shells when exposed to low salinities during in situ feeding trials, although O. lurida appeared to be more sensitive to salinity stress than C. gigas. For this study, thresholds for feeding activity were set to a mean salinity > 10 for O. lurida and > 5 for C. gigas. To estimate hydrodynamic parameters for Yaquina Bay, we used the Finite Volume Community Ocean Model (FVCOM) simulations developed by Lemagie and Lerczak (2015). FVCOM is especially useful for investigating estuarine hydrodynamics because its unstructured grid allows for high spatial resolution (50 m2 within the estuary) and the ability to account for tidal elevation, water properties, and currents in topographically complex areas. The model uses the National Oceanic and Atmospheric Administration (NOAA) National Geophysical Data Center (NGDC) Central Oregon Coast digital elevation model (DEM) 1/3 arc sec bathymetry to resolve the estuary channels and intertidal regions (http://www.ngdc.noaa.gov/dem/squareCellGrid/download/320). The simulations are forced at the boundaries with a sine-function tidal amplitude of 1.25 m at the locally dominant semidiurnal tide component period (M2) of 12.42 h. Two simulations with constant river discharges of 5 m3 s−1 (dry season) and 100 m3 s−1 (wet season) were used in this study to examine the seasonal variability in currents and stratification. Seasonal discharge rates for the main stem of Yaquina River were derived from previous hydrological studies in which contributions from tributaries (Elk Creek and Yaquina River) and relevant drainage areas account for total inflow of freshwater to the system (Sigleo and Frick 2007; Brown and Ozretich 2009). Each simulation was run with steady river forcing until the spatial extent of the estuarine salinity reached a tidal steady-state. After the model reached a statistical equilibrium period (i.e., spin-up), results from one tidal cycle were used as representative of the system for each season. These conditions are not necessarily representative of average conditions (Fig. 1b), but a representation of conditions that we chose while examining the differences between two typical discharge scenarios with varying idealized conditions. Statistics from this tidal cycle were interpolated to locations on a uniform 150 m × 150 m grid that were used to describe the hydrodynamic conditions for virtual benthic oyster populations. Statistics derived from FVCOM that were particularly relevant for our model include: (1) mean, minimum, and maximum water column depth; (2) water column salinity, surface salinity, and bottom salinity over a tidal cycle; (3) the percentage of time that a location in the estuary is dry; (4) the average salinity stratification and the standard deviation over a tidal cycle; and (5) how long virtual particles released throughout a tidal cycle reside in each 150 m × 150 m grid cell before exiting the estuary (Fig. 2a). We estimated the spatial distribution of historic O. lurida populations within each model cell (Fig. 2b) from detailed surveys of oyster grounds in Yaquina Bay conducted by Wygant (1908). The historic abundance (116 m−2) and mean size of individual oysters (shell height = 35 mm) were estimated from Dimick et al. (1941), as in zu Ermgassen et al. (2012). For simplicity and comparative purposes, model populations of C. gigas were distributed similarly to O. lurida in the estuary, but mean individual size was either held equal to a mean shell height of 35 mm for Olympia oysters or adjusted to represent a more likely mean shell height for this species (mean shell height = 60 mm; see zu Ermgassen et al. 2013a). Adjustments of clearance rates of C. gigas followed the allometric equations of Gray and Langdon (2018) to allow comparison of our results with previous FS estimates of C. gigas in Yaquina Bay (zu Ermgassen et al. 2013a). To account for the hydrodynamics and residence time of Yaquina Bay, outputs from the FVCOM hydrodynamic model were obtained under river conditions representative of both wet and dry seasons. The circulation fields from FVCOM were used to track virtual particles that were initially distributed uniformly in volume over the 150 m × 150 m horizontal grids at 1 m depth increments throughout the bay. In order to account for the tidal variability in the circulation, particles were released at eight stages in the tide, with the release times each adjusted to be at t = 0. This virtual particle tracking method generated a particle location data file with the location of each particle within the bay given as a function of time, until more than 1/e of the particles exited the bay. A local residence time was defined for each cell in the bay as the average time that a neutrally buoyant virtual particle released in a random location spends in that cell before leaving the estuary; however, we provided another estimate of residence time (hereafter referred to as full estuary residence time) defined as the time needed for the concentration of virtual particles to reach 1/e their original value. We define FS as the proportion of the estuary cleared by oyster populations in one estuary residence time period. 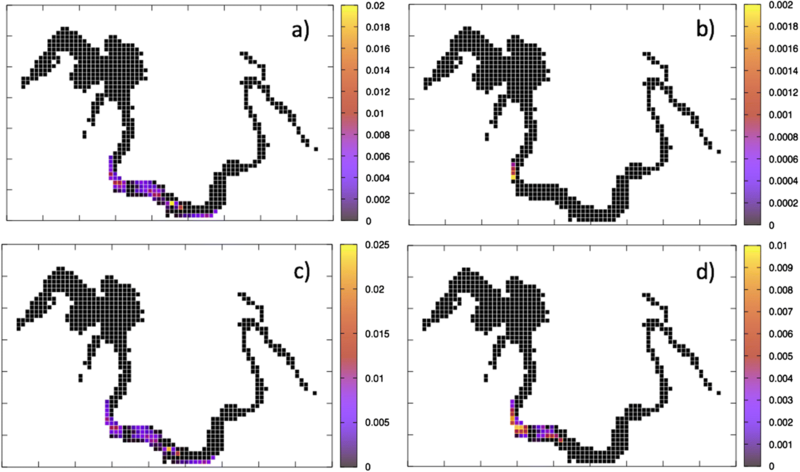 To quantify FS of virtual oyster populations, we developed a code in C++ to process the particle location data file from FVCOM according to the following model: each particle was initialized with a particle concentration of 1 as we were interested in the fraction of particles removed by oysters per time step. At each time step, we reduced the particle concentration within a given cell based on the predicted clearance rates of oysters in the cell in that time period (i.e., fraction of cell volume cleared per time step). We assumed that particle clearance occurs only in cells containing oysters; there was no increase in the concentration of particles above the initial concentration and no new particles entered the estuary over time. We modeled the clearance rates of the oysters using the in situ-based feeding model described earlier, with parameters chosen appropriately for wet and dry seasons. Clearance rates were found to be affected by several environmental factors (e.g., OC, TPM, T, S), which varied significantly between seasons (Gray and Langdon 2018); therefore, we applied seasonal means of OC (dry = 37%, wet = 23%); TPM (dry = 19.69 mg l−1, wet = 33.61 mg l−1); and T (dry = 14.7 °C, wet = 11.8 °C) from Gray and Langdon (2018) across all cells to represent the modeled initial conditions as no other spatial information for these parameters were available; however, salinity value estimates, which were provided by the hydrodynamic model, varied among cells. Uncertainty around oyster filtration services were examined by creating lower and upper estimates of these services, which were derived using the lower and upper 95% confidence intervals of clearance rate equation coefficient estimates (computed from Gray and Langdon 2018). As a result, FS estimates with non-overlapping uncertainty could be regarded as being significantly different from one another. The code records the amount of volume cleared in each cell during each time step, allowing us to compute the total amount of material removed from the water column and how much of that was removed in each individual cell. This also allowed us to identify the cells where oysters were contributing the most to filtration within the bay. We note that this definition of filtration accounts for “downstream effects,” i.e., that some water reaching any given cell will have been partially filtered by oysters upstream of that cell. FS of each species were modeled under the following scenarios: (1) the effect of season (wet vs. dry) within the historic Olympia oyster habitat; (2) prioritizing cells for restoration by their potential to contribute FS (termed “directed restoration” hereafter) versus randomly filling cells in the oyster’s historic habitat. In this second scenario, all cells started empty, at each step we “restored” oysters in one cell per time step within the historic habitat. 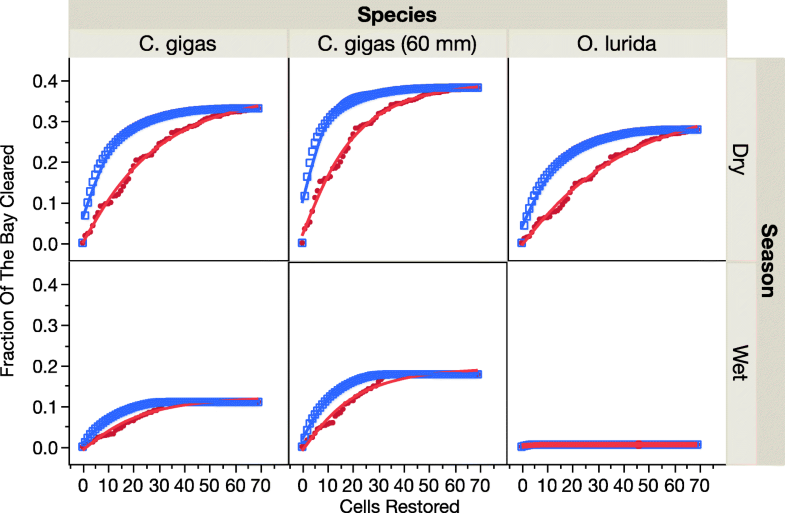 The order of cell filling for directed restoration was chosen by running the model described above and identifying which cell resulted in the greatest increase in FS. This cell was then restored to historic abundance and the process was repeated until all cells were filled to their historic distribution. As a control, historic habitat was restored haphazardly by filling one randomly selected cell per time step without consideration of the effects on FS. Local residence times per 150 m × 150 m cell, using the definition in the methods, were found to vary spatially and seasonally. These ranged from 0 to 4.8 h and 0 to 0.23 h in the dry and winter seasons, respectively (Fig. 2). The estuary residence time, as defined in the methods, was 79 h and 27 h during the dry season and wet season, respectively (Table 1). Note that although the modeled discharge increased by a factor of 20 from dry to wet season, the residence time of the estuary was reduced by a factor of three. This can be partially explained by the change in estuary volume (i.e., the total number of cells simulated in the q = 100 case is more than twice that in the q = 100 case). Secondly, we averaged the estuarine residence time over the whole bay. In the wet season, greater river forcing increases the flow in the main channel accordingly. However, flow rates out of the main channel and toward the sides of the estuary were not increased by the same factor, so the average full estuary residence time did not change to the same extent as the channel’s residence time. Clearance rates were estimated to vary seasonally for O. lurida from 0.85 l h−1 gDTW−1 during the dry season, declining to 0.28 l h−1 gDTW−1 during the wet season when salinity was ≥ 15 ppt within cells (Table 1). The modeled dry season clearance rate of C. gigas was 1.13 l h−1 gDTW−1. The all-season clearance rate equation for C. gigas (Eq. 3), which was used during the wet season model scenario, was dependent on salinity; as a result, C. gigas clearance rates during the wet season were estimated to range from 0.43 to 1.97 l h−1 gDTW−1. The FS (proportion of the estuary cleared of virtual particles) by either species varied by location and by season. The proportion of the estuary cleared by a single cell of historically dense oysters varied from 0.00 to 1.95% across all seasons for O. lurida and 0.00 and 2.74% for an equally sized population of C. gigas (Fig. 3). After summing the effect of suspension-feeding oysters for all cells combined, we estimated historic populations of O. lurida during the dry season cleared 27.9% of Yaquina Bay within one estuary residence time (Table 1). A population of C. gigas with the same mean shell height and spatial distribution cleared 31.9% of the estuary during the dry season. Wet season filtration services of historic populations of O. lurida were estimated at 0.5% of the Yaquina Bay while a similar population of C. gigas cleared 12.7%. Filtration services of C. gigas increased markedly after adjusting clearance rates for oysters with an average individual shell height of 60 mm—a typical size for adult C. gigas, with 37.4% and 20.0% of the bay cleared within one estuary residence time during the dry and wet seasons, respectively (Table 1). In general, after examining uncertainty among models, FS provided by C. gigas were found to be significantly greater than those provided by O. lurida under each model scenario (Table 1). where a is the asymptote, b is the scale, c is the curve’s growth rate, and Step is the degree of restoration in terms of the number of cells restored. For small values of Step, Eq. (7) can be approximated as filtration services = a + b + bc step, so the relationship is approximately linear, with gradient bc. As step tends to be large values, the model approaches the constant value of a + b provided c < 0. The best-fit values of these parameters for each of the model scenarios are given in Table S1. We see that in all cases, the value of the curve’s growth rate and the product of scale and growth rate are smaller for the random restoration scenario than the directed scenario (Fig. 4), indicating that FS increases more rapidly under directed restoration in all cases. From this analysis, a detailed map was created which depicts areas of historic O. lurida habitat within Yaquina Bay that should be prioritized for restoration in order to garner the greatest filtration services possible with the least amount of effort (Fig. 5). After standardizing to the maximum FS achievable under each model scenario within historic oyster grounds, we rearranged Eq. 7 to predict how many restored cells would be required to reach 50% of maximum FS under directed restoration versus random restoration (Table S1). In the dry season, 50% of the maximum FS can be achieved by directed restoration of approximately 25% of the area required to reach the same FS under random restoration, with restoration of 3–7 cells required under directed restoration and 12–30 cells required with random restoration. In the wet season, directed restoration could yield half-maximum FS with approximately 40% of the restored area needed by random restoration, with 5–7 cells needed under directed restoration compared to about 15 cells under random restoration (Fig. S1, Table S1). The only time FS generated by random restoration were similar to directed restoration was during the wet season with O. lurida, when overall services were weak (0.5% of the estuary cleared) and nearly 50% of the total filtration service was provided by a single cell (Table S1). The first attempt to model O. lurida and C. gigas in Yaquina Bay was made by zu Ermgassen et al. (2013a) in which historic populations of O. lurida were estimated to clear a very small proportion of Yaquina Bay (1% of bay cleared per estuary residence time) during the summer when environmental conditions were modeled to elicit maximum feeding activity. Other non-native oysters were considered (C. gigas and Crassostrea virginica) and found to clear marginally greater proportions of this estuary than historic populations of Olympia oysters due to their higher maximum filtration rates. This led zu Ermgassen et al. (2013a) to conclude that historic populations of O. lurida were unlikely to have significantly affected seston concentrations at a whole-estuary scale in Yaquina Bay. The updated FS model presented in this study suggests that O. lurida and C. gigas could clear a much larger fraction of the estuary than previously estimated by zu Ermgassen et al. (2013a), but that these services vary substantially between species, season, scale of restoration, and area of the estuary in which the oysters are restored. Several estuaries in the PNW have experienced a rapid increase in populations of C. gigas after introductions (e.g., Willipa Bay; Dumbauld et al. 2011). Most PNW estuaries, including Yaquina Bay, have cooler water temperatures that limit natural recruitment (Pauley et al. 1988); however, the biomass of this non-native species in estuaries has increased dramatically over the past several decades due to hatchery production of seed that is planted by oyster farmers. Previous studies have suggested that the feeding activities of large C. gigas populations (natural or cultured) can approach the carrying capacity of estuaries and provide different FS to those of native bivalves in the PNW (Ruesink et al. 2005, 2006; Ramsay 2012; Wheat and Ruesink 2013) and elsewhere, such as western Europe (Markert et al. 2010; Herbert et al. 2016). Our model results agree with previous studies that suggest C. gigas could provide significantly greater FS than O. lurida in Yaquina Bay. In fact, under all model scenarios, the non-native C. gigas was estimated to clear a significantly greater proportion of the estuary than native O. lurida (Table 1); for example, even at equal densities and similar average individual shell heights, FS of C. gigas were significantly greater than those of O. lurida (e.g., 12.7% and 0.5% of the estuary volume cleared during the wet season, respectively) due to its higher clearance rates and greater tolerance of low-salinity conditions. Differences between FS contributed by these two species were more pronounced when clearance rates were adjusted to reflect a more realistic shell height for C. gigas (60 mm) in the model scenario (20.0% of the volume cleared in the wet season). As water temperatures continue to warm in the Pacific Northwest due to climate change (Mauger et al. 2015) and/or the oyster industry grows substantially, the expansion of C. gigas and the potential impact that these animals could exert on water quality may become increasingly apparent (Troost 2010; Herbert et al. 2016). In the PNW, seasonal rains and the resulting changes in water quality and hydrodynamics are important to consider when estimating FS of oysters. For both species, FS were estimated to be greatest during the dry season (Table 1) when river forcing on estuary residence time was low and salinity, seston organic content, and temperatures were significantly greater (Gray and Langdon 2018). Even under these environmental conditions, O. lurida cleared 28% of the estuary, implying that historic populations of O. lurida were unlikely to play a dominant role in affecting seston concentrations. Nevertheless, these FS (Table 1) were similar to those contributed by historical populations of C. virginica as estimated by zu Ermgassen et al. (2013b), suggesting historic populations of O. lurida represented equally powerful ecosystem engineers as their east coast equivalents. Our model does not allow 100% estuary clearance since the concentration decreases exponentially, C = C0e−kt and does not reach zero. As described earlier, an exponential model is linear for small timescales, C = C0 − C0kt. This linear approximation predicts full filtration after a time t = 1/k, and such simple linear models are often used to assess FS. In the more accurate exponential model, a time t = 1/k corresponds to a concentration that is 1/e = 0.37 times the starting value. Therefore, a 63% filtered fraction in this model would roughly correspond to full clearance in a simple linear model, which was not approached by any model result. Sequentially adding Olympia oysters to cells in its historic habitat markedly and nonlinearly increased the proportion of the estuary that was cleared (Fig. 4). Importantly, when restoration was directed toward cells with the greatest potential for filtration services (Fig. 5), on average, 50% of the maximum FS could be reached after restoring just five cells. In contrast, placing oysters randomly in its historic habitat required 2–4 times the population and area before achieving the same outcome (Fig. S1). Directed restoration can build filtration services with smaller populations because there is variation in FS across cells. This variation arises partially from differences in residence time among cells, partially from differences in the proportion of each cell occupied by oysters historically and, to a lesser extent, from upstream pre-filtering of water by other oysters. Assumptions accompany the development of any model and our work was no exception. First, we assumed perfect mixing within each model cell. We acknowledge, however, that Yaquina Bay can vary from a stratified salt-wedge in the wet season to being well-mixed in the dry season. Imperfect mixing may alter the distribution, movement, and fate of seston (Smayda 1980), which may also limit the access of oysters to these particles; however, assuming oysters had full water column access was a simplifying and conventional assumption that makes our results comparable with previous modeling efforts but was also necessary during model development as seston distribution data in Yaquina Bay was unavailable. The assumption of perfect mixing was most tenuous during wet season, possibly leading to some filtration services overestimation for both species; however, data gaps prevented us from quantifying this possible source of error. Conversely, during the low-flow conditions of the dry season, Yaquina Bay becomes well-mixed (Burt and McAlister 1959; Brown and Ozretich 2009; Lemagie and Lerczak 2015) and should improve water column access to benthic communities. Indeed, recent work has demonstrated that benthic mussel communities may exert considerable top-down control over seston after estuaries become well-mixed (Teixeira et al. 2014). Therefore, we contend our approach to modeling oyster access to seston was defensible and the study results were reasonably accurate and comparable to previous modeling efforts. Second, we assumed clearance rates were constant and retention efficiencies of seston were 100% during model simulations. However, we parametrized oyster clearance rates based on those described by Gray and Langdon (2018) who estimated in situ clearance rates of both species within the historic oyster habitat of Yaquina Bay. Their methods integrated variation in feeding activity over seasons to create an average in situ clearance rate of oyster feeding on natural seston. Our model also assumed that the composition and concentration of virtual suspended particles was static and uniformly distributed throughout the estuary at the start of each simulation as no other spatial information was available for Yaquina Bay, and no information about the nature of the particles was coded into the model. While we acknowledge that seston composition can be complex and the ability of oysters to remove particles from suspension is dependent on particle size, shape, and other surface characteristics (Langdon and Newell 1990; Barillé et al. 1997; Ward and Shumway 2004), we believe that earlier characterization of seston at the site supported the use of this model. Gray and Langdon (2018) measured particle sizes in Yaquina Bay and found that 92% of the particle size distribution was between 4 and 9 μm and the total seston concentration of these particles was approximately 27 particles μl−1. Retention efficiencies of O. lurida are unknown, but previous studies with other Ostrea spp. suggest that this species would have been able to clear this size range of seston particles with near 100% efficiency (Möhlenberg and Riigård 1978). Third, we acknowledge that particle concentration affects the feeding activity of many oyster species (Widdows 1978; Gerdes 1983; Barillé et al. 1997; Kesarcodi-Watson et al. 2001; Riisgard et al. 2003), including that of O. lurida and C. gigas (Gray and Langdon 2018, 2019). Concern may arise that as model populations fed they may have reduced seston to a point which begins to negatively impact feeding activity; however, even during maximum FS (i.e., approximately one third of bay cleared during the dry season), the resulting concentration of modeled particles remaining in suspension (i.e., 18 particles μl−1) would have been within the range that still elicits strong feeding activity with 100% retention efficiency for Ostrea spp. (Wilson 1983). Similarly, high retention efficiencies and high levels of feeding activity have also been reported for C. gigas at these seston concentrations (Barillé et al. 1993, 1997). It is worth noting that the in situ clearance rates used here are more conservative and significantly lower than maximum rates measured in laboratory studies (Gray and Langdon 2018), which were used by zu Ermgassen et al. (2013a) in previous FS modeling efforts of these species in Yaquina Bay. Therefore, we believe this model represents a key improvement in our understanding of the FS of these species in Yaquina Bay. Additionally, we have focused on oysters as members of the benthic community. In reality, the large and complex epibenthic communities associated, and often dependent on oyster reefs for settlement sites, may provide much greater FS than oysters alone (Kellogg et al. 2013). Consequently, our results are conservative when expressed in terms of the FS of oyster-based benthic communities. As O. lurida represents a foundational species within a complex benthic community (Kimbro and Grosholz 2006), FS of other suspension-feeding community members could be included in future modeling efforts. Our model provides important insight that could aid in Olympia oyster restoration. We found that FS estimates for restoration efforts can vary substantially at small spatial scales (150 m × 150 m), so it may be prudent for managers to direct restoration efforts to areas with the highest potential for providing the greatest FS, if that is a high priority ecosystem service. It should be noted, however, that areas providing the greatest FS may, however, not coincide with the areas best suited for providing other ecosystem services. As an example, North et al. (2010) determined that separate ecological benefits and services of restoration within the Chesapeake Bay differed by location and did not always overlap spatially due to complex interactions between the physical environment and biological processes. Their model suggested that oyster harvests could be optimized by restoring 15 acres of the upper reaches (Chester River) of the Bay, but 30 acres of the mid-section of the bay (Choptank River) should be prioritized for restoration to maximize seston reduction in the mainstem. Generating multiservice ESS models will help resource managers more effectively allocate resources and meet broader ecological and economic restoration goals. Setting realistic goals and identifying optimal outcomes for oyster restoration is challenging (Coen and Luckenbach 2000). It is unclear what proportion of suspended particulate matter cleared by oysters would be optimal for the whole estuarine ecosystem. Without carefully accounting for many biotic and abiotic factors that are influenced by large populations of oysters, it will be difficult to estimate interactions between the benefits of enhanced FS, such as increased light penetration, nutrient load reduction, and consequent shifts in trophic linkages and biogeochemical processes (Ulanowicz and Tuttle 1992). As an example, burrowing mud shrimp, Upogebia pugettensis, and the softshell clam Cryptomya californica live commensally together in the same burrow to form the “U. pugettensis shrimp burrow complex,” occurring at high densities in many PNW estuaries (e.g., > 300 burrows m−2; Dumbauld et al. 1996). Not only does U. pugettensis and C. californica retain and consume similar particles to C. gigas, the vast, dense populations of “U. pugettensis burrow-complexes” in Yaquina Bay may clear all of the overlying water (3.88 × 109 l) more than once per day (Griffen et al. 2004). Furthermore, U. pugettensis is thought to exert a significant role in biogeochemical cycles in Yaquina Bay (D’Andrea and DeWitt 2009). Consequently, restoring Olympia oysters or cultivating Pacific oysters conceivably could limit food resources for U. pugettensis, alter biogeochemical processes, and affect nutrient cycling. While it is recognized that large suspension-feeding bivalve populations can exert top-down control over primary production and ecosystem functions (Dame 1996; Newell et al. 2004; Banas et al. 2007; Washington Sea Grant 2015), resource managers should consider broader impacts when restoring oyster populations. Integration of carrying-capacity models with ecophysiological-hydrodynamic models such as ours, which seeks to evaluate water volumes cleared by restored populations, may be useful to set more ecologically comprehensive and sustainable goals prior to restoration efforts. Our overall methodological approach may assist in the design of FS models for other locations and bivalve species. Our approach is based on our previous conclusion that in situ rather than laboratory studies are required for modeling oyster clearance rates in this highly dynamic system (Gray and Langdon 2018). Other researchers have similarly reported that oyster feeding behavior under in situ conditions cannot be accurately reproduced under optimal laboratory conditions (Grizzle et al. 2008; Cranford et al. 2011 and references therein). Laboratory studies are commonly viewed as being valuable for examining the feeding responses of oysters to separate, controlled environmental factors, but in situ studies are needed to determine feeding responses to complex and co-varying environmental factors (Powell et al. 1992; Newell and Langdon 1996; Cranford 2001; Cranford et al. 2011; zu Ermgassen et al. 2012). The hydrodynamic model used in this study accounted for complex hydrodynamic and bathometric features of Yaquina Bay, which are not always included in FS models (e.g., Fulford et al. 2010). Hydrodynamic factors becomes especially important to consider when water is stratified (Gerritsen et al. 1994; Cloern 1996; Pomeroy et al. 2006). Furthermore, salinity estimates at the per cell level provided by this model allowed for inclusion of salinity effects on oyster feeding activities (Eq. 3). Finally, estuary residence time has been ignored in some modeling efforts (e.g., Newell 1988; Ruesink et al. 2006) or greatly over-simplified using bulk formula approaches (Dame and Prins 1997; zu Ermgassen 2013a, b). In particular, the tidal prism method has been frequently used to estimate residence time but this method may be inappropriate in some estuaries, such as Yaquina Bay, where the underlying assumption that the tidal prism represents a small fraction of total estuary volume is not met (Lemagie and Lerczak 2015). Previously, zu Ermgassen et al. (2013a) used the estimated residence time of 1 day for Yaquina Bay from Bricker et al. (2007), while we estimated estuary residence time can range from 1 to > 3 days during the wet and dry season, respectively. FS are expected to be more impactful in systems where the ratios of oyster biomass to water volume are large and residence times are long (Dame and Prins 1997; Prins et al. 1997; Dame 2016), but encounter rate (i.e., the number of times a particle entered an area containing oysters) also plays an important role in determining the magnitude of FS. Collectively, our model results contribute to the growing body of research demonstrating the importance of accurate hydrodynamic models in determining bivalve-ecosystem interactions (Banas et al. 2007; Cerco and Noel 2007; North et al. 2010; Lucas and Thompson 2012; Filgueira et al. 2014). Numerous ESS would undoubtedly be augmented if O. lurida was restored to historic levels in Yaquina Bay, which may lead to improved ecosystem health and environmental quality. Indeed, our model results indicate O. lurida may have had a much greater role in improving water quality and clarity in Yaquina Bay than had previously been estimated. Interestingly, C. gigas now likely dominates this estuary and model results suggest this species would provide greater FS, especially during the wet season, if it were to reach the historic biomass or densities of O. lurida. These data agree well with those of other modeling reports on how FS may have shifted with the establishment of the larger and non-native Pacific oyster in novel environments. Nevertheless, these data suggest that if restoration of O. lurida proceeds in Yaquina Bay or elsewhere, resource managers should be aware that their FS may be more effectively achieved if restoration efforts are directed to areas with long local residence times. Hydrodynamics is known to play an important role in other ecological processes regarding oyster restoration, including direct and indirect effects on nutrient cycling (Reidenbach et al. 2013), larval recruitment (North et al. 2008; Kim et al. 2010; Whitman and Reidenbach 2012) and oyster reef growth/burial (Lenihan 1999; Thomsen and McGlathery 2006), but to our knowledge, our model represents the first example of how such information can be used to direct restoration for the explicit purpose of enhancing FS of an estuarine suspension feeder, such as the native oyster O. lurida. This manuscript was improved by the careful review of Chris Eardley and Brian Arnold, two anonymous reviewers, and thoughtful advice from the editors of the journal. MWG and CJL would like to thank the National Estuarine Research Reserve System, NOAA (Award No. NA10NOS4200025) for funding experiments. Additional support to MWG was provided by the Oregon Society of Conchologists. PzE would like to thank The Nature Conservancy for supporting this work. EL and JL were supported by Oregon Sea Grant (#NA10OAR4170059) and the National Science Foundation (NSF #OCE-1260394). Gray, M.W., and C.J. Langdon. 2019. Particle processing by Olympia oysters Ostrea lurida and Pacific oysters Crassostrea gigas. Estuaries and Coasts. https://doi.org/10.1007/s12237-018-0480-x. zu Ermgassen, P., M.D. Spalding, B. Blake, L.D. Coen, B. Dumbauld, S. Geiger, J. H. Grabowski, R. Grizzle, M. Luckenbach, K. McGraw, W. Rodney, J. L. Ruesink, S. P. Powers, and R. Brumbaugh. 2012. 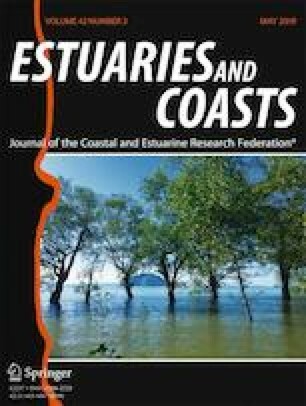 Historical ecology with real numbers: past and present extent and biomass of an imperilled estuarine habitat. Proceedings of the Royal Society B: Biological Sciences 279: 3393–3400. https://doi.org/10.1098/rspb.2012.0313.